GASKETLOK - Medice Manufacturing has done it again! Announcing our new line of Valve Cover Spacers incorporating our innovative GASKETLOK feature. Unwilling to remain stagnant, we have enhanced our already superior designed and machined valve cover spacers with our new GASKETLOK feature that incorporates a relief cut in critical areas. This addition process causes the gasket material to become imbedded into the spacer providing a tighter grip of the gasket against the spacer surface. 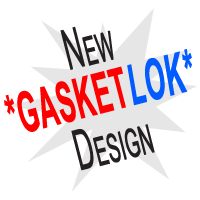 The new GASKETLOK is compatible will all premium gaskets on the market. The result is a better seal with greater gripping action to keep the gasket in place. A leading USA manufacturer of solid billet aluminum valve cover spacers, Medice Manufacturing has never had even a single complaint about leaks using their spacers. We believe this is largely contributed to using billet aluminum, as compared to many other such products on the market made by a casting method. Additionally, our machining process is 100% CNC controlled for exact-repeatable specifications. Our original traditional design is an excellent choice for your prized ride, and now our new premium GASKETLOK takes it one step farther. See our new products! With Medice Manufacturing Valve Cover Spacers you no longer have to use tall valve covers to clear enhanced-performance valve train components. Utilize your factory valve cover (or any valve cover) and gain space for high performance valve train parts/components. Our valve cover spacers come in 3/8”, 1/2” and full inch thickness. Installation could not be easier and you can run most any valve train components such as higher ratio long slot rocker arms and roller rocker arms. Application dependent, often times our valve cover spacers will clear stud girdles, pedestal mounted rocker arms, and shaft mounted rocker arms. Maintaining a near stock appearance with factory valve covers while increasing the usable space for custom valve train components is just a few clicks away with a set of Medice Mfg. Valve Cover Spacers. Our Valve Covers Spacers are manufactured from a single piece of billet aluminum made right here in the U.S.A. We perform extensive fitment testing for every spacer on real engine heads. From design to programming to CNC milling to quality control; every step is completely performed at Medice Manufacturing. No outsourcing what-so-ever. Our commitment to unsurpassed quality in materials and workmanship will show as soon as you receive your valve cover spacer. If you do not see your application in the catalog give us a call. 3/8” and 1/2” spacer kits include Stainless Steel bolts. 1” spacers require a ‘Stud & Nut’ kits available at an additional cost. You can find these in our Catalog under the ‘Stud & Nut Kits’ category for various engine head applications. When you need to store an engine there are numerous steps that should be performed to ensure that when you bring an engine back it is ready. One such step is to seal the engine so nothing foreign gets into the engine such as dust, dirt, bugs, even little critters. Utilizing our engine storage kits and parts will greatly reduce this from happening. Our engine storage kits include precisely engineered and manufactured plastic block off parts for most all engine openings. All parts C-N-C machined for proper fit. 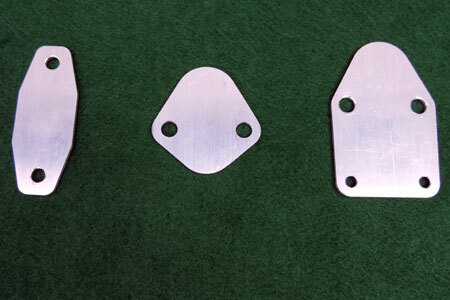 Kits include Carburetor Plate, Exhaust Ports Plates, Fuel Pump Cover, Thermostat Housing Plate, Water Neck and Water Pump Caps, Distributor Hole Plug, Vacuum Caps, Bolts, and Washers. These kits are also excellent for engine shipping and painting. Browse our catalog for applications. If you do not find your engine in the catalog, give us a call. Even if you only use a kit to paint an engine block you will save a considerable amount of time over taping the block as it typically takes about 5 minutes to install our kit  and just 5 minutes to unbolt. No more cutting and trimming masking tape for hours, then to have the tape pull off some of the paint when removed, let alone having at times to scrape the stuck tape off the block and trying a variety of chemicals, which often removes more paint. Our Stor-Em kit will prove worth the cost in just one block paint project; yet you can use the kit over and over and over again. 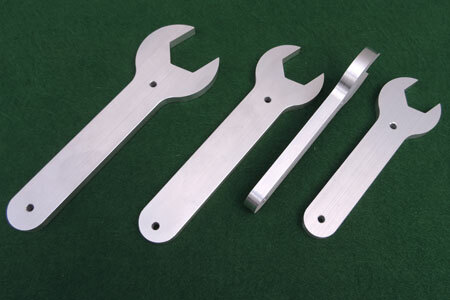 Along with our Valve Cover Spacers and Engine Storage Kits, we manufacture Heavy Duty AN Wrenches which are substantially stronger than most competitor AN Wrenches. We offer some billet aluminum accessories. One of the great accessory products we manufacture is our aluminum Fuel Pump Block-off plates  at just 1/8” thick they are flat, simple and lightweight. Browse our catalog to discover great products at competitive prices. Many of our products can have your custom lettering or logo placed on them. Give us a call to discuss your specific project.